Here I am going to share the testimonial of Sandhya Chauhan, who is a Biotechnology student and had undergone Post Graduate Diploma in Patent Law and Management from IIPTA. She sis Masters in Biotechnology from GSS Indraprastha University with 76%. She did her project in Cloning of 3’UTR and Coding DNA Sequence of Human MED26 Gene under Dr. Rinu Sharma, Assistant Professor, GGSIPU. She believes to work in an organization where I can utilize my knowledge and technical skills to benefit the organization as well as develop myself over a period by assimilating and putting into practice my knowledge and skills. Immunology: ELISA (Sandwich, Dot) – determination of antibody titer, double diffusion technique, determination of blood group and RBC count technique. Instrumentation: pH meter, UV-Spectrophotometer, Agarose gel electrophoresis, PCR, SDS- PAGE, Paper and thin layer chromatography. Microbiology: Measurement of bacterial and fungal growth, isolation and enumeration of microorganisms from soil, air and water, MPN test. Molecular Biology: DNA and RNA isolation, Plasmid isolation, Quantification of DNA, DNA amplification, Luciferase assay. Bioinformatics: tRNA scan-SE, Primer Designing, BLAST, miRANDA, TargetScan, miRDB. Sandhya has this classroom program from IIPTA and was very much satisfied after the classes which she undergoes under Patent Agent Mrs. Cheshta Sharma. She understood everything very well, and moreover was very much clear about the Program. 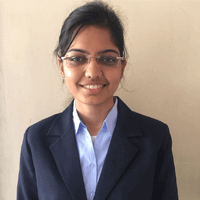 She also got selected for the Internship process in IIPTA.